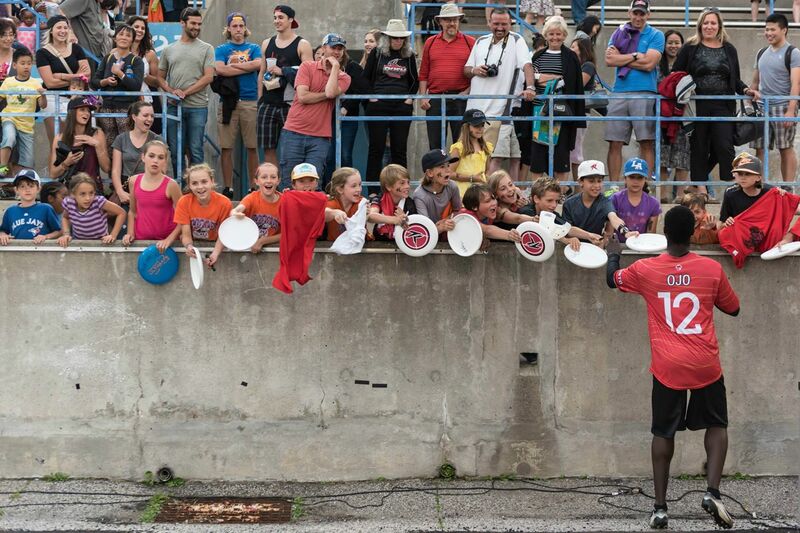 Why Ultimate Frisbee is for Families – Meet the Toronto RUSH | Kids in T.O. One of the best places to experience Ultimate is watching one of our city’s most winning-est teams – the Toronto RUSH at Varsity Stadium. The professional Ultimate team tours the Canada and the US as part of the American Ultimate Disc League. What the F is Ultimate: It’s a fast-paced non-contact team sport that combines the best of many sports (cutting like soccer, pivoting and jumping like basketball, diving like volleyball and catching the disc in the end-zone like football.) It’s self-officiated, meaning players make their own calls. (At the pro level, referees make the calls.) If you’re keen have a look at the rules and Ultimate lingo before you go. wanna play? Contact the Toronto Ultimate Club for info on its Youth Ultimate programs. Getting there: The entrance to Varsity Stadium is on Bloor St. W at St. George. Paid street parking and underground parking in the area. Closest subway stop is St. George. Low-down: Tickets are – youth/student/senior $10.95 (advance) and $12.95 (game day); adults $12.95 (advanced) and $15.95 (game day.) Kids 5-and-under are free. Games are usually 2 hours long – there is one intermission. Snacks: Some fast-food / vending machine-type food and drink available. Kid-friendly: Kids can head to field level to test their accuracy and toss some discs. On Sunday, May 1 there is a Star Wars-themed game. In the hood: The Royal Ontario Museum and Bata Shoe Museum are in walking distance. Buy a Toronto RUSH disc and head to the closest green space to toss and run ‘em — two blocks north at Taddle Creek Park (with playground), Philosphers’ Walk next to the ROM or head to Queen’s Park Circle.